I have to say, one of the coolest things I’ve gotten to do so far in journalism was this interview. 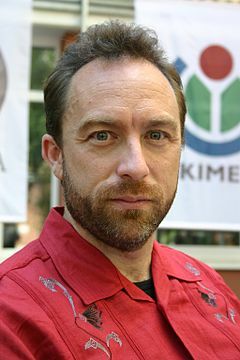 Jimmy Wales, co-founder of Wikipedia, was in Israel last month for Wikipedia’s annual conference. He had a lot of interesting things to say about Wikipedia, journalism, and the tent protests going on in Israel. Check it out! This entry was posted in Cultural, Peace & Justice, Published and tagged Favorite Wikipedia Definition, Interview, Israel, Jimmy Wales, Journalism, tent protests, Wikipedia by Laura Rosbrow. Bookmark the permalink. Laura, I think you meant to say “co-founder of Wikipedia”. Dr. Larry Sanger is the one who spearheaded the idea of an openly-edited wiki encyclopedia; Sanger named it “Wikipedia”; Sanger issued the first public call for participation; and Sanger championed many of the early guidelines and policies that still govern the Wikipedia community today. Wales found some wiki freeware and installed it on a server that his company owned. The idea of Wales as “the founder” is rather preposterous, in light of the factual history. Wales has asserted that he is the sole founder of Wikipedia, and has publicly disputed Sanger’s designation as a co-founder. Sanger and Wales were identified as co-founders at least as early as September 2001 by The New York Times and as founders in Wikipedia’s first press release in January 2002. In August of that year, Wales identified himself as “co-founder” of Wikipedia. Sanger assembled on his personal webpage an assortment of links that appear to confirm the status of Sanger and Wales as co-founders. For example, Sanger and Wales are historically cited or described in early news citations and press releases as co-founders. Wales was quoted by The Boston Globe as calling Sanger’s claim “preposterous” in February 2006, and called “the whole debate silly” in an April 2009 interview. So, when can we expect you to rename the title of this web page? That’s pretty awesome that you’d actually change the title, Laura! Meanwhile, did Jerusalem Post Lite get permission from either Maurice Lacroix or the original photographer for the promotional photo of Jimbo in the charcoal gray jacket?